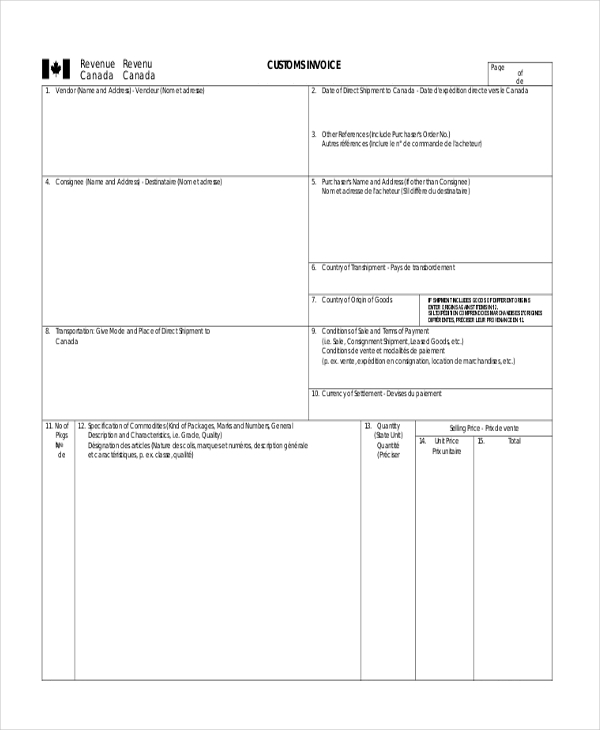 A person or organization that exports materials uses a commercial invoice form to declare the details of the consignment to the customs department. The form contains details of the clients along with the details of the products being exported like their name, size, quantity, rate etc. Thus, commercial invoice forms are extremely important to legalize the export of products and to save the organization from any kind of legal hassles. You may also see Sample Invoice Forms. This is a blank invoice form that contains the standard format which most commercial invoices use. The user can use the form as it is or make changes to it by adding relevant subheads. This invoice form is generally used by an organization that may be involved in exporting its products to an international customer. The form helps the company to declare the details of the products to the customs department. 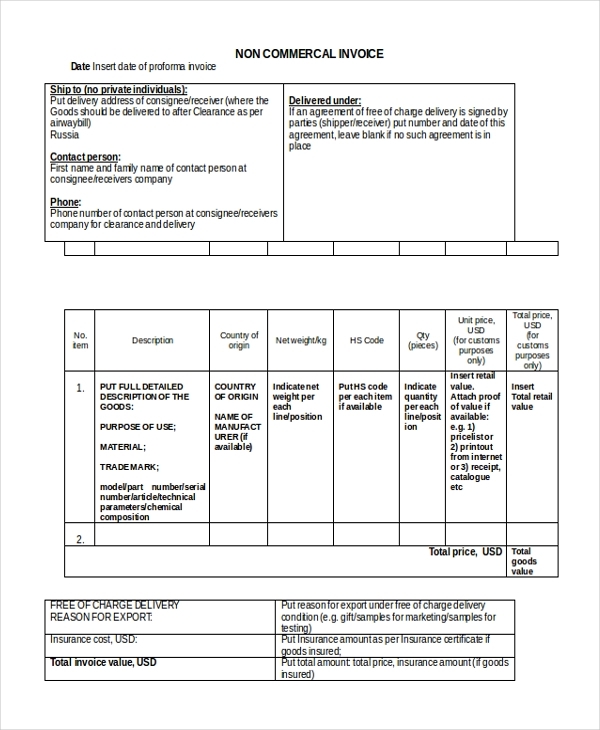 As the name indicates, this is a blank invoice form that can be used by anyone to design a unique commercial invoice for his use. The user can easily make changes to the form to customize it. 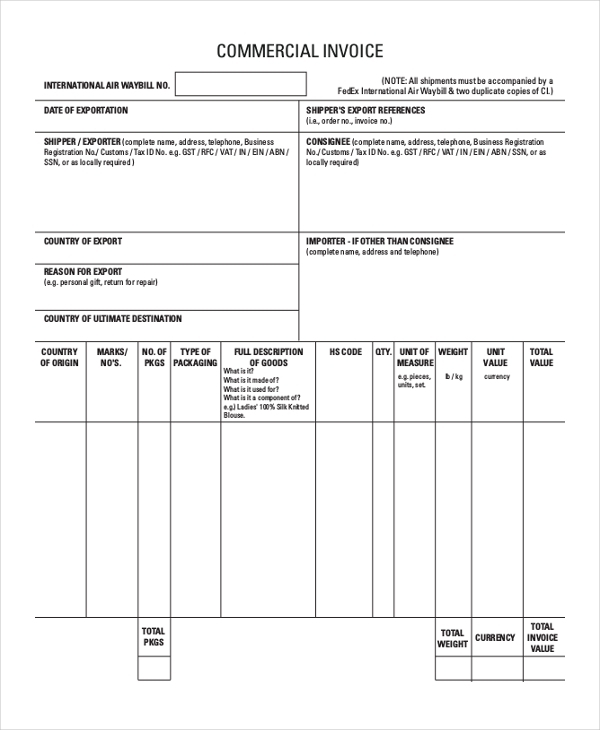 A person who ships products to a client on the international shores uses this invoice to inform the customs of the products that he is exporting. The form contains the details of the products exported. Usually when a person ships certain items to the international shores for personal use, he is required to use a non-commercial invoice form to declare the details of his shipment with the customs. 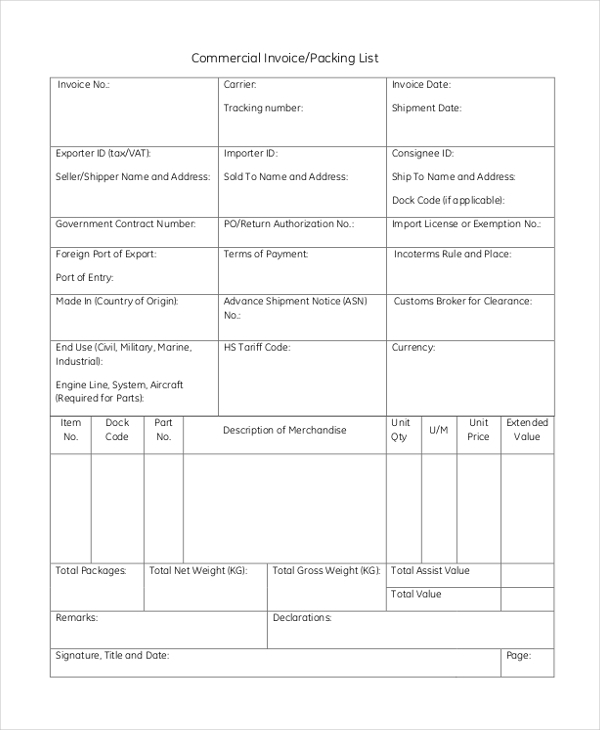 Any corporate house wishing to ship its products to an international customer uses this invoice form to declare the details of the shipment to the customs department, in order to legalize the process. 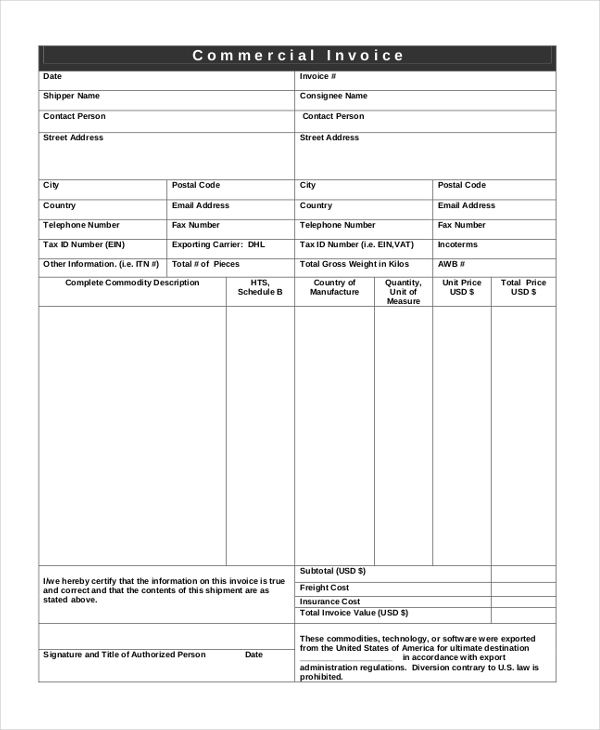 As the name indicates, this form is used by an organization to list the items that it wishes to export. The form elaborates on the item details on the list and is submitted to the customs. What are the Benefits of Using Commercial Invoice Forms? How Can One Use Commercial Invoice Forms? The person using a commercial invoice form should first fill in the details of the client to whom the shipment is being sent. Next, he should add in the details of the products being shipped like their name, size, quantity, rate, total value etc. He may also have to include a few declarations which assure the authorities that his invoice is genuine. Finally he should put in his signature and the seal of the company. You may also see Commercial Lease Forms. Designing a commercial invoice form can be sometimes quite confusing. In case, you too are stuck with this, don’t worry. 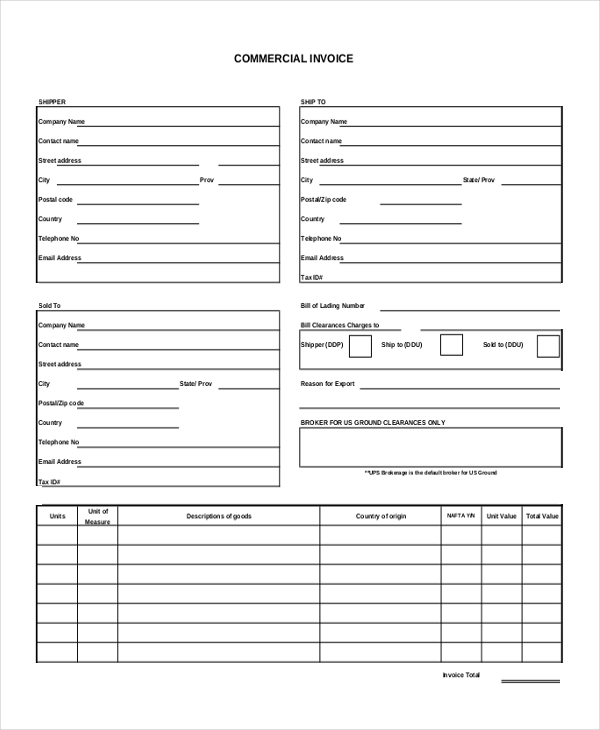 Just take a look at the wide range of commercial invoice forms that we have to offer. Download the one that is apt for you and make changes to it to personalize it. 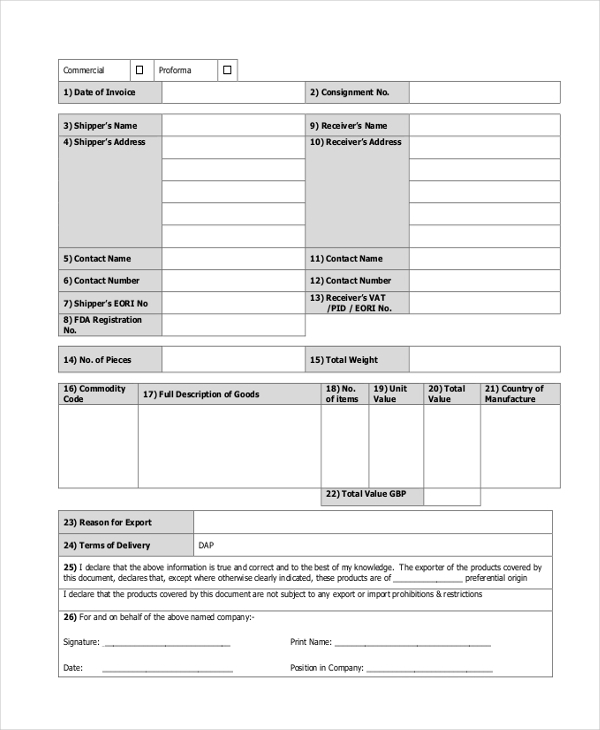 You can also see Commercial Lease Agreement Forms.